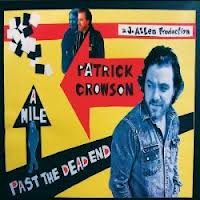 Patrick Crowson certainly doesn’t do things in small measures and shows no fear in going intensely down his chosen route. The eleven tracks on his latest album release A MILE PAST THE DEADEND take around an energy sapping 70 minutes to evolve and while there are glimpses of merit in the soft dry melancholic sound from his guitar, you are left waiting for that stand out track to make true connection. There are elements of the album where you get mesmerised by the hook of the relaxing soothing sound but the intensity turns the listen into a demanding experience. A large dose of patience, stamina and a desire to uncover the next Dylan may be required to fully grasp the concept of this record. Originating from Illinois USA, the limited online presence of Crowson seems to be the domain of Swedish based backers Hemifran who have some very fine under rated US artists in their posse. There are ambitious references to Dylan, Kristofferson, Van Zandt and Newbury in his press and maybe Crowson is destined to follow the path of the latter two with a patient wait for recognition, although he hopes it won’t be post-humus. If there’s a hidden gem in this body of work, the depth is probably a little too buried for a casual listener, many of whom have drifted away by the time the third track finishes, 30 minutes into the album! On a positive note, you can envisage the live presence of Crowson, with his stripped down acoustic sound in an intimate setting, being an altogether different experience where you can get to know the artist and further grasp the intricacies of his passionate desire to interpret roots-influenced acoustic music. Also on track nine on the album, ‘Mark the Drifter’, there are significant gear changes in his vocal delivery that do give some welcome relief and a glimpse to what else he may have to offer. So while it is difficult to recommend this record on the basis of a couple of lengthy listens, you just never know that maybe one day we are returning to this body of work to uncover the roots of a genius, Just like we do with Townes Van Zandt and Mickey Newbury.